Blackman started day two of the TSSAA State Wrestling with five wrestlers still alive and fighting for a chance to medal. As we found out on day one, nothing is guaranteed in wrestling. The farther you get in the state tournament, the tougher and tougher your opponents get. The morning session started at 120 pounds in the quarter-finals with Blackman’s Tre’von Thomas facing off against Bradley Central’s Ryan McElhaney. McElhaney came into the tournament as the two seed and certainly has a reputation as a formidable opponent. Tre’von does not care about reputation so nothing changed in his approach and he scored the first takedown of the match! While all the Blackman fans cheered, McElhaney got fired up and scored 2 reversal and 2 nearfall to end the first period 2-4. We have to give Tre’von credit. He hung tight but the match ended in a minor decision for Bradley 4-11. In the consolation bracket, Jalen Brown(132) started Saturday off with Mt. Juliet’s Austin Sparks. Jalen scored the first takedown and never looked back while cruising to a 6-0 decision. Also in the consolation bracket, freshman Landon Fowler made quick work of McGavock’s 145 pounder Freeman, taking him down twice in the first period and then pinning him in 1:10. Back in the quarter-finals, Matthew Sells put on a strong performance against Cedric Lynn from Memphis East. Lynn was the Region 8 Champ in the Memphis area but wasn’t at the same level as Sells. Matthew did give up an uncharacteristic reversal near the end of the bout but it wouldn’t matter in the end. The final score was 13-3 and Sells advanced to the semi-finals. Andre Bravo had an extremely strong and impressive start to his quarterfinal match against Northwest’s Dylan Carney. Bravo brought the tempo and scored the first takedown with a nice outside single. Following a restart, Carney escaped and earned a point. Bravo shot in on an ankle pick, picked it up and switched to a double. On the way down to the mat, he got a little high, his feet went over his head and he fell right into a headlock. 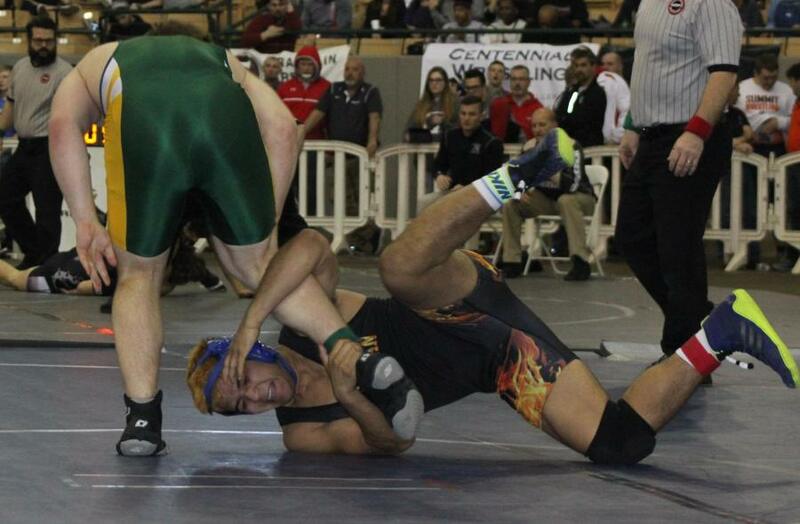 The lock was too much for him to escape and the match ended in a fall. In the 4th round consolations, Tre’von Thomas faced Findley from Stone Memorial. Down 3-1 at the end of the second period, Tre’von found the next gear and reeled off 8 points in the final period to win 9-3. Jalen Brown earned a victory over Maxwell from Gibbs with a third period reversal – winning 5-3. Immediately following, Landon Fowler lost a heartbreaking 4-3 decision to Junior Austin Mathews from Bradley Central. The loss ended Fowler’s impressive freshman season leaving him with a record of 45-7. (Amazing record for a freshman!) Senior Andre Bravo’s 4th round consi draw was unfortunate as it put the state’s 4th and 5th ranked guys in a win or go home situation. Justin Johnson from Stone Memorial is a great wrestler and somehow found a way to pin Bravo in the second period. The loss Ended Bravo’s season leaving him with a record of 41-7. 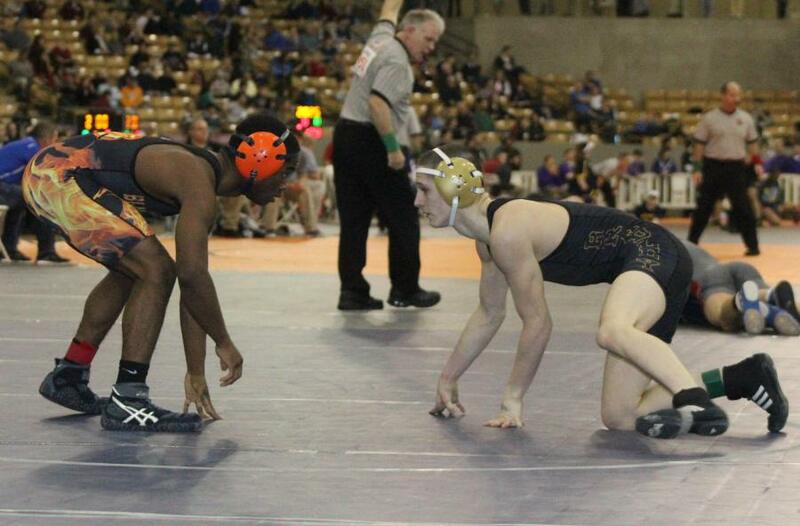 Blackman put only one in the semi-finals. Junior Matthew Sells faced Knoxville Halls’ Colton McMahan for the second time this season. Sells defeated McMahan 4-2 in the finals of the Bradley invitational back in December so everyone knew this would be a great match. Sells was fired up and came out guns blazing. He fired off a couple of shot attempts and ended up taking McMahan down with a double-leg near the edge. McMahan escaped and the period ended with Sells up 2-1. McMahan chose down and tied it up with an escape but Sells scored another takedown before the period ran out ending the period 4-2. Sells chose down in the third and McMahan worked for a turn. Sells made repeated attempts to escape but McMahan kept a crotch lock every time he stood up and rode him out. With about 20 seconds left, Sells was penalized for stalling and time expired. Final Score 4-3. Blackman has a finalist! If you’re in the consolation bracket, the 5th round consi round is the blood round. 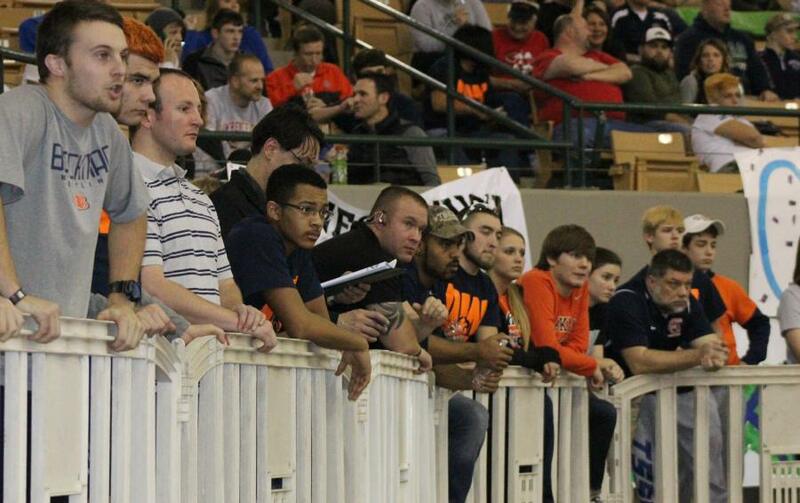 It’s do or die if you want a state medal and both of Blackman’s remaining wrestlers had to face super tough opponents. Tre’von Thomas faced Cleveland’s Logan Whiteside. Whiteside has impressive credentials for a freshman and at one point was favored by some to be a four-time state champion for Cleveland. Once again, Thomas didn’t care about any of that. The first period ended 0-0. Tre’von chose down and escaped. Whiteside then scored a takedown and Tre’von escaped again ending the second period 2-2. Whiteside scored a reversal in the third, Tre’von got a penalty point and it looked like he may tie it up but time expired. Final Score 3-4. In his blood match, Jalen Brown had last year’s runner-up from Tennessee High, Corbin Hurley. Jalen has done a phenomenal job as a freshman and posted a record of 46-12. He gave Hurley all he wanted and more. The first period ended 0-0 with both wrestlers trying to score often. Hurley chose down in the second period and managed an escape to end the second period 0-1. Brown chose down in the third period and tried time and time again to escape. Hurley had an unconventional way of dropping down to a leg and hanging on long enough to manage a return and was never called for stalling. Brown couldn’t get away and the match ended 0-1. Brown’s season came to an end but man his future looks so bright!! So at the end of the day, we saw some great wrestling by our two freshman (Brown and Fowler) and outstanding efforts from our two seniors (Thomas and Bravo) but only one wrestler qualify for a medal. At this point being the end of the season, it is easy to feel sorry for those who didn’t achieve their goals. Blackman qualified 11 and only placed one this season. While that sure isn’t what we hoped for, there is always a silver lining in wrestling. Those ten young men all had their eyes on the prize and even though they didn’t win a medal, they all know they are winners. All ten of them know that they are capable of doing things they didn’t think they could do. All ten know what it is like to fail, and most importantly, all ten know how to pick themselves up and keep moving forward. For some people, that is a lesson not learned until later in life. No one likes to see a kid fail or learn a tough lesson, but often times, those lessons are the most important ones they will ever learn. Check out the PHOTOS page for some great pics!